All of the reviews of this session note the mastery of McDuff’s organ work but then go on to call it a somewhat standard session. If only all jazz sessions were lived up to this standard! True en’uff it doesn’t reinvent the vibraphone, but those vibes and the soul-flavored jazz here is consistenly strong. And the songs do open up – I ‘specially liked “Yeah, Baby” and “Smooth Sailing” and the title track. The interaction of the sax and organ works small wonders and I found myself always bringing the music into the foreground of my attention even though I initially grabbed this one out of the pile to be jazz wallpaper. How wrong I was! Add to it McDuff’s next record, The Honeydripper, and a joyous listening experience was had by all. Yes, I admit it, I love the London Review of Books, but not as much as the New York Review of Books. Through their collective pages I’ve read more challenging articles and been inspired to buy more books than I can move past on the way from bed to bathroom late at night. Hobsbawm is one of the historians I first met in its pages, and I find his work to be dazzling, from his look at the 19th century to the state of modern Judaism. More details on that another time, but for today I was pleased to come across this little gem from him. Give it a quick read – it’s about his days as a jazz critic and darned if it doesn’t more fully enamour me of him (wow – odd sentence!). No he doesn’t name check Jack McDuff, but the timelines roughly synchronize, so perhaps Eric saw Jack. Just try to use utopianism and communism in a sentence and not refer to something he already commented on in one of his books. Add to that a description in his article about the first time he saw Ray Charles perform. Yow! 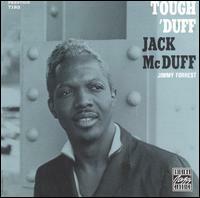 But before I close out this post, I’ve gotta say that my most favorite Brother Jack McDuff record is still, and always will be, Down Home Style. Just check out this smokin’ hot BBQ of a tune – and dig that LP cover!